Let us help your dreams of a beautiful backyard or private putting green become a reality with professional installation and high-quality synthetic grass. Imagine that there was an easier solution to maintaining the grass on your property, whether it’s a residence, business, country club, or golf course. Imagine enjoying a leisurely game of golf in your own backyard with professional-grade putting greens. Now imagine that such a dream is, in fact, very attainable! 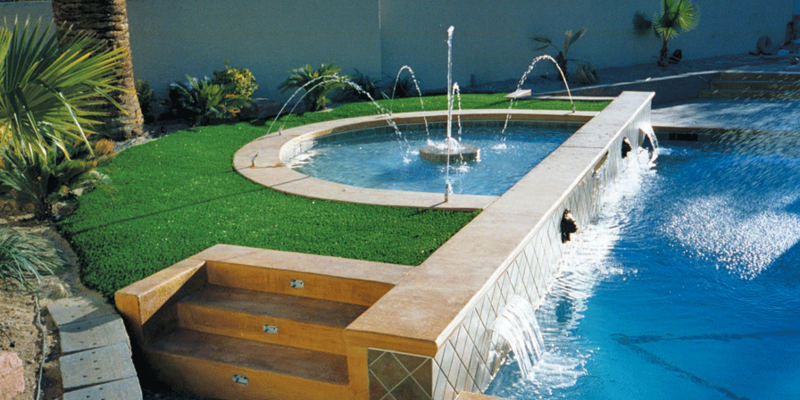 Palm Springs Greens offers the highest quality artificial grass and golf greens in Palm Springs and many other cities throughout California, as well as Yuma, and a few other cities in Arizona. We’ll create a custom design uniquely tailored to your specific needs and style, ensuring you get a beautiful landscape for your budget! Synthetic grass not only looks and feels lush and beautiful all year long, but it saves you time, money and labor, too! 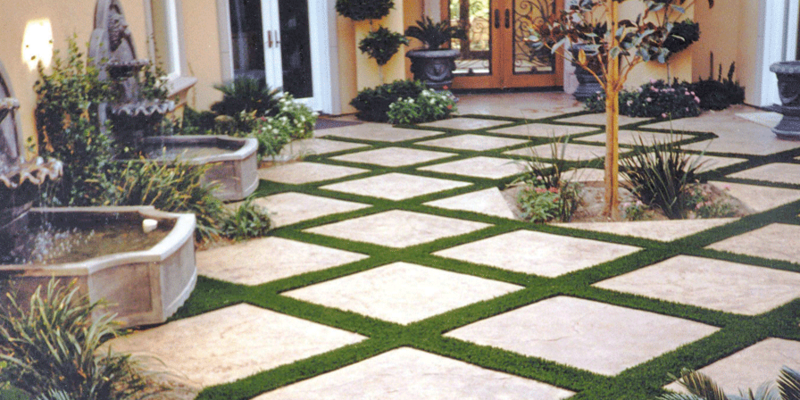 Artificial lawns don’t need to be fertilized, mowed or watered, making them the perfect low-maintenance solution for homeowners who want to have more free time and lower their monthly bills. Homes with synthetic lawns often experience up to a 60 percent decrease in their monthly water bills, since watering the lawn is no longer a concern. It’s also the environmentally responsible option; our artificial turf is made with renewable materials and doesn’t require mowing, thus eliminating harmful emissions from a lawnmower. It’s not always easy to find the time to go out to the local golf course, so why not bring the course to your home? Our artificial grass putting greens look and feel like the real thing and offer the same level of play that the professionals enjoy. 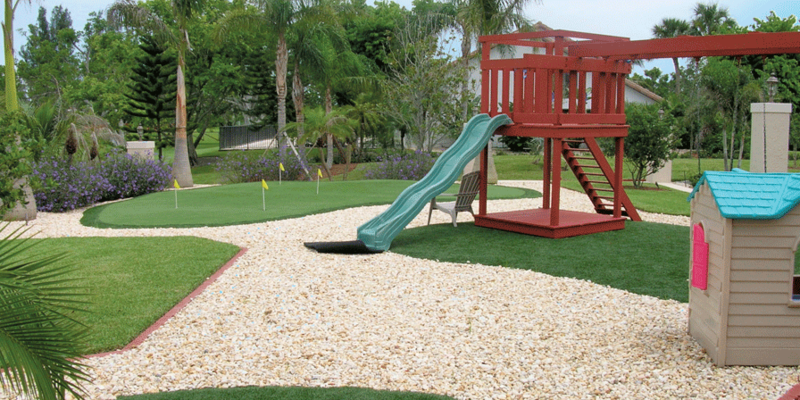 Custom designed to seamlessly blend with any landscape and flow naturally around a pool, children’s play area or any other backyard features, our golf greens bring the look and feel of the course to your own home. Enjoy a game at your leisure and practice your putting game as often and as long as you like! 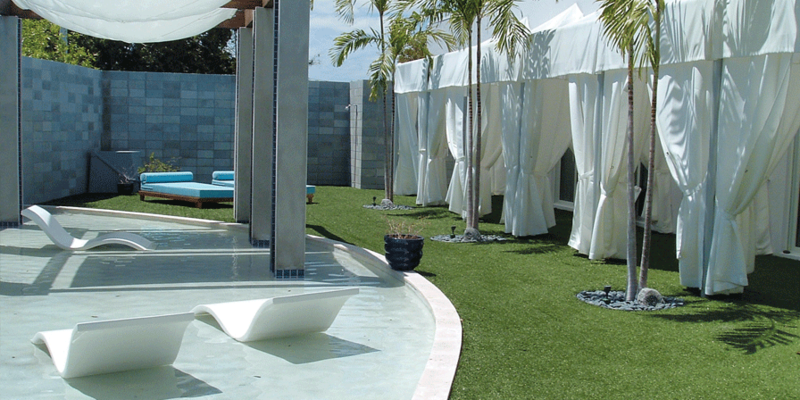 Our artificial grass can be found all over Palm Springs in residential backyards, businesses, country clubs, and more. We are proud to offer only the highest quality product and service to our clientele throughout California and Arizona. If you’re ready to experience the difference and enjoy the benefits that artificial grass provides, don’t wait another minute! Call (760) 275-7866 or contact us online to get a FREE consultation today! Custom building an indoor or outdoor California putting green for your backyard practice space begins with a free green consultation, and ends with a golf green construction that will bring you a lifetime of golf enjoyment. Design and installation of a synthetic grass Palm Springs putting green, made of 7600 denier polypropylene artificial turf for your personal or commercial play area, takes all the parameters of your current layout into account. The lifelike sheen and natural ball play of one of our beauties will astound and delight you for years to come. 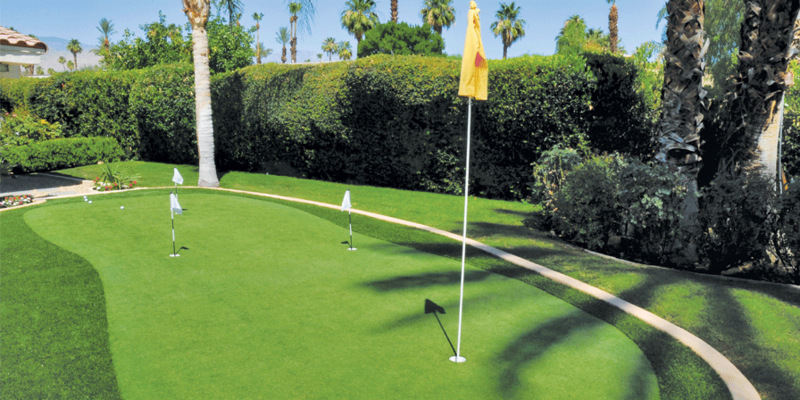 Palm Springs Putting Greens made of longer–bladed, bent–grass artificial turf fibers will raise your golf game to new levels! 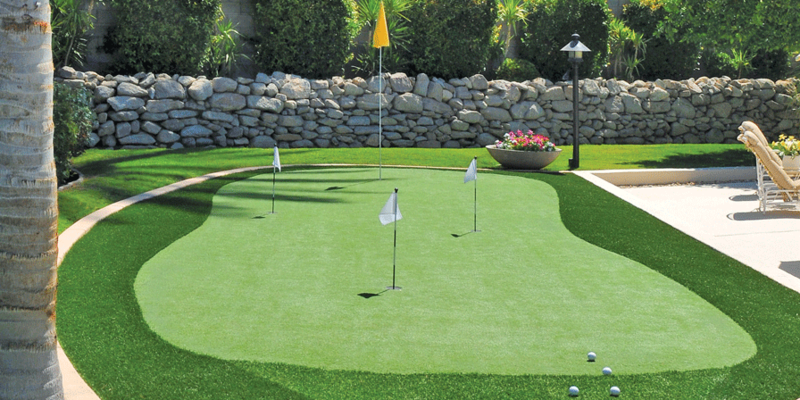 Our pro–endorsed synthetic grass California putting greens glow with a lifelike sheen and playability that will improve any backyard or indoor practice space. Our golf green construction finishes in around three weeks, so you can begin honing your golf game at home, in privacy, amongst friends and family!